At Weill Cornell Medicine’s Center for Global Health, the spirit of mentorship has thrived for four generations. Dr. Warren Johnson, the B.H. Kean Professor of Tropical Medicine in the Weill Department of Medicine and the Center’s founding director, has had many mentees. But his relationship with Dr. Jean Pape (MD ’75), the Howard and Carol Holtzmann Professor in Clinical Medicine and founder and director of GHESKIO, Weill Cornell Medicine’s partner clinic in Haiti, has spanned nearly 40 years and created a remarkable success story surrounding global health and the treatment of HIV/AIDS, tuberculosis and malaria. In the late 1990s, Dr. Pape began mentoring an infectious diseases research fellow, Dr. Daniel Fitzgerald, who is now professor of medicine in the Weill Department of Medicine and recently succeeded Dr. Johnson as director of the Center for Global Health. These mentor-mentee relationships evolved over time, providing support and guidance as the doctors’ careers advanced and the GHESKIO program grew and flourished. That commitment to mutual success helped to foster a sustained culture of excellence that has led the Center to become an inspiring example of Dean Augustine M.K. Choi’s vision of mentorship at Weill Cornell Medicine. Under Dean Choi’s leadership, Weill Cornell plans to accelerate growth – and ensure that talented students and faculty achieve their full potential – by committing to mentorship and dedicating funds to support those efforts. In 2014, Weill Cornell named the Joan and Sanford I. Weill Department of Medicine, in honor of the couple’s longstanding dedication and philanthropy to the institution. Since then, the department has expanded its commitment to fostering the careers and achievements of its members. Dr. Fitzgerald is an admirable example of the impact that mentorship and philanthropy can have on the careers of junior faculty. In 2016, he received Weill Cornell Medicine’s mentorship award, funded by Jessica Bibliowicz, chairman of Weill Cornell’s Board of Overseers, and her husband, Natan Bibliowicz. Dr. Fitzgerald has several protégés, including a fourth-generation mentee in the department – Dr. Jyoti Mathad (MS ’12), assistant professor in the Weill Department of Medicine. Dr. Mathad collaborated with Drs. Fitzgerald, Pape and Johnson through her global research in pregnant women with tuberculosis, and has benefited from her mentors. For fellows and faculty interested in pursuing a career as a physician-scientist, the Weill Department of Medicine Pre-Career Award Program also provides funding during the crucial period when research training ends and an initial faculty position begins. 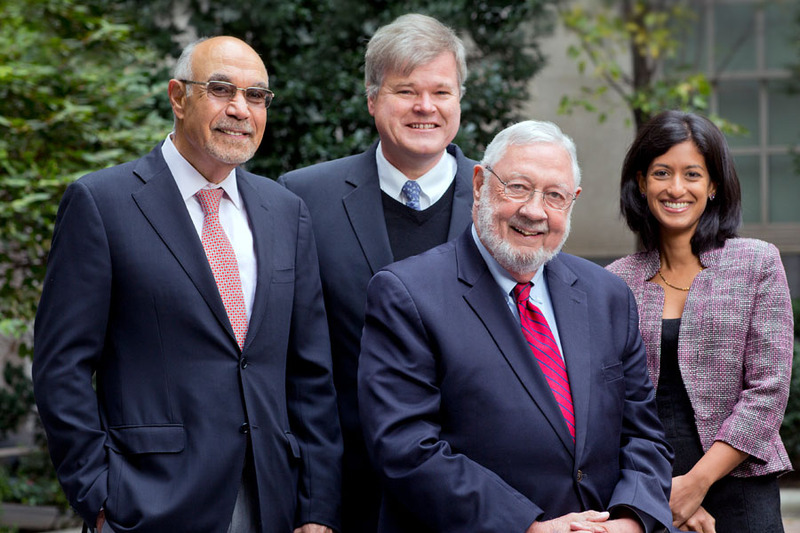 Available to all medical school faculty and in its sixth year, the Leadership in Academic Medicine Program (LAMP) offers resources to allow senior faculty mentors to connect with a small cohort of LAMP participants, all early-career faculty. The small groups meet three times during the nine-month program, which is funded by the Office of Faculty Development, providing a great cross-pollination of senior faculty with rising stars. “These esteemed leaders, who represent multiple departments, generously give their time and expertise in a way that enriches both mentor and mentee,” says Dr. Judy Tung, associate professor of clinical medicine and co-director of LAMP with Dr. Lia Logio, vice chair for education, associate dean for faculty development and the Herbert J. and Ann Siegel Distinguished Professor of Medicine. Dean Choi’s vision of a vigorous and dynamic culture of mentorship is a top priority, evident in his efforts to explore ways to reward mentors and engage with faculty to expand mentorship-related programs. Since 2015, the Weill Cornell-FARM program (Faculty Advancement and Research Mentorship), founded by Dr. Paraskevi Giannakakou, professor of pharmacology and pharmacology in medicine, and Dr. Joseph Scandura, associate professor of medicine, has provided mentorship to junior faculty in 14 departments, divisions and institutes across Weill Cornell. The program provides help with grant applications to about 20 junior faculty members annually and has generated more than $12.5 million in funding through grants. Beyond the personal benefits, a culture of mentorship can become a powerful recruitment tool. “Sharing our success stories really helps to bring in and retain the best and brightest at our institution,” says Dr. Giannakakou. As Dean Choi prioritizes programs and nurtures departmental initiatives, the atmosphere of mentorship and collaboration will continue to grow and flourish at Weill Cornell. Milestones, the Weill Cornell institutional newsletter, is published four times a year and highlights some of our recent donors and exciting developments.